SOFIA - Chinese Premier Li Keqiang said that China is ready to strengthen cooperation with Croatia in infrastructure construction. Li made the remarks during a meeting with his Croatian counterpart, Andrej Plenkovic, on the eve of the seventh leaders' meeting of China and 16 Central and Eastern European (CEE) countries, which is scheduled for Saturday in Sofia. China and Croatia enjoy sound development of bilateral ties and their cooperation has yielded solid results, Li said, adding that China hopes to strengthen high-level exchanges and cooperation in various fields with Croatia. Li noted that bilateral cooperation in major projects has achieved a breakthrough, with a Chinese company having won the bid for the Peljesac Bridge project in the Eastern European country. He hoped for the two sides to continue their efforts and turn the bridge into a model project for China-Croatia and even China-Europe cooperation. China, he added, will continue to support Chinese companies participating in the construction of ports, railways and other infrastructure in Croatia, in line with Croatia's needs and in accordance with EU regulations and market principles. Li also hoped for the two sides to continue allowing small- and medium-sized enterprises (SMEs) to play their role, so as to blaze new trails and build new pillars for bilateral and even China-CEE cooperation. China is willing to work with Croatia to strengthen their cooperation in tourism and people-to-people exchanges, said the Chinese premier. For his part, Plenkovic said Croatia-China practical cooperation has made new progress, and Croatia hopes that the two sides will take the Peljesac Bridge project as an opportunity and further strengthen their cooperation in infrastructure construction. He said Croatia welcomes investment from China and stands ready to strengthen cooperation between the two countries' SMEs and in such areas as tourism and people-to-people exchanges. 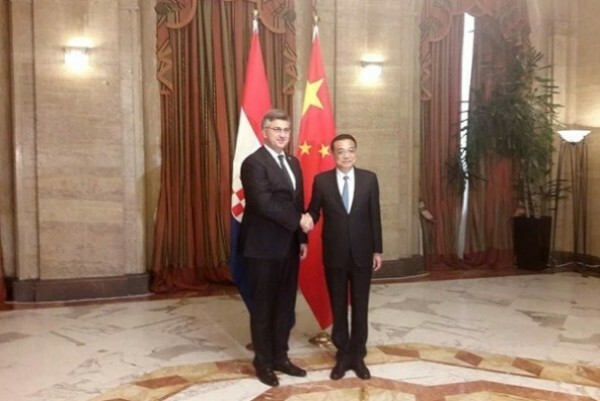 Croatia, he added, is willing to play a positive role in the development of EU-China relations.